The Bicentennial Quarters of 1976 were made to commemorate the 200th anniversary of American Independence. In October 1973 the US Treasury Department announced an open competition to select a design for each of the quarter, half dollar, and dollar designs. 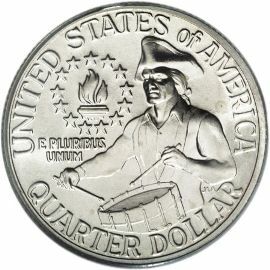 Out of about a dozen semi-finalists for the quarter, Jack L. Ahr was chosen for his depiction of a Colonial Drummer. the motto "IN GOD WE TRUST" is located in the left field of the coin. 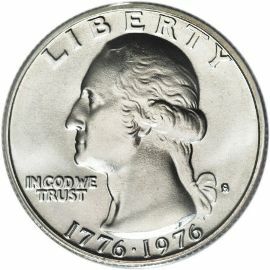 Mintmarks are located to the right of the ribbon in Washington’s hair. The reverse of the coin shows a colonial drummer with "E PLURIBUS UNUM" in the left field. Also, the inscriptions "UNITED STATES OF AMERICA" and "QUARTER DOLLAR" surround the entire design.